I've mentioned before that I prefer low-key Valentine's Day celebrations in my own home. The only problem with this approach is that home can feel a bit "boring" and "everyday". A great way to avoid this blasé feeling is by creating a new environment in your home inspired by a specific location...like PARIS! 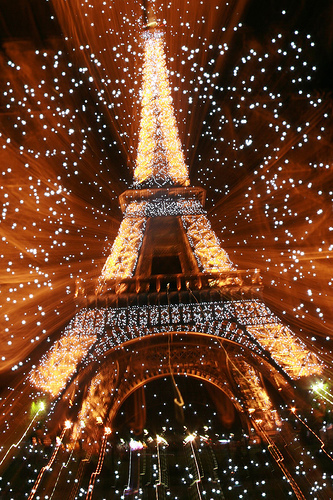 We'd all like to spend a night under the lights of the Eiffel Tower, right? Well, if traveling to Paris tomorrow isn't in the cards for you, then go ahead and bring the city of lights to you! Hang some twinkle lights (I know it hasn't been too long since the Christmas decorations were packed away), light some candles, play some French music (this compilation is my favorite) and enjoy a simple meal together. I think it will surprise you how much music and lights can transport you to another place, even if only for a night. looove twinkle lights! they can transform a blank room! Twinkle lights - I like that idea. I'm always a bit sad after having to take down my Christmas lights. I feel like I've never quite had enough of them, unlike the people in the Northern Hemisphere who gain the benefit due to limited daylight hours. We left some of our white lights up this year. I was a little worried that it was a bit trashy, but love how cozy they make our living room look. It's definitely made the after-holiday transition much easier! great idea.. i think red lights would be so cool for valentine's day, french music, french wine, french food. i love paris!